38th & Chicago: Intersecting Stories is a collaborative project by Wing Young Huie and Stephanie Lynn Rogers based on a shared interest in zines and Rogers’ desire to build upon existing neighborhood infrastructure. Together, they worked with residents of the blocks immediately surrounding the intersection of 38th Street and Chicago Avenue in South Minneapolis to create a zine of hyper-local stories. This publication was then distributed through the robust system of Little Free Libraries in the four neighborhoods surrounding the intersection: Bancroft, Bryant, Central, and Powderhorn. Huie and Rogers paired young residents with those who had lived on the block for more than 10 years, asking the young neighbors to interview their elders about the neighborhood. The interviews were recorded, edited, and printed. Common themes emerge through different perspectives. 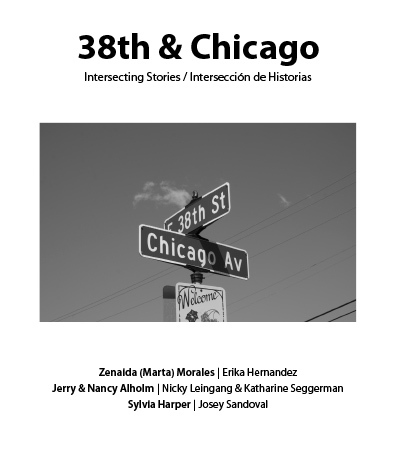 38th & Chicago: Intersecting Stories served as a pilot project for the creation of hyper-local media and distribution systems. Get in touch to inquire about bringing this project to your neighborhood.